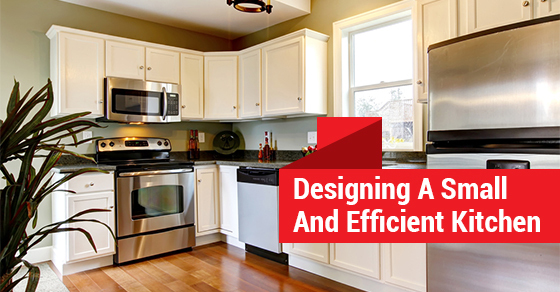 When you have a small kitchen space, it is important to design it as efficiently as possible. Working with a kitchen designer is critical. They will help you to come up with a good plan that will provide you with a useful long term solution. When dealing with a small kitchen, the most common issues include clutter, lack of counter space, and overflowing cupboards. The reality is that your kitchen doesn’t need to be this way – if you work with a skilled design professional, they will make your small kitchen space more organized and efficient. Rolling or Pull Out Island: By having a rolling or pull out island, you can use this space for storage or as a breakfast area. Wall Storage: If you use different types of mounted storage tools, you can use them to store utensils, mugs, plates, and pots, as well as your herbs and spices. Metallic Backsplash: Not only does it add an updated look but it actually makes your space feel bigger. Removable Sink Cutting Board: This helps to keep your counters clutter free. You can use it when you need it and put it away when you are finished with it. Pull Out Cabinets: With this pull out cabinet, you add extra counter space ; you can pull it out when you need it and tuck it away when you don’t need it. Drop Down Table: Have a wall mounted design installed that can be stored or dropped down as needed. Pegboard Pot Rack: Buy a pegboard, paint it your favorite color, and hang it up. You can use this space to store utensils, pots, pans, and much more. Contact us today to speak with a kitchen designer at Avonlea that will turn your kitchen dreams into reality.